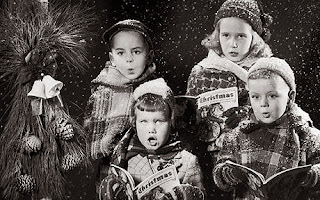 English Teacher On The Loose: CRACKERS ABOUT CHRISTMAS! Let me get off to a cracking start by wishing you all a merry Christmas and a happy New Year 2014! 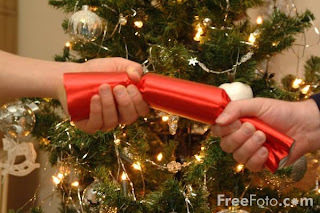 So with a bit of history on the Christmas cracker - a super Brit tradition and some Christmas carols with a difference I hope you thoroughly enjoy the festivities! Don't stay up until the crack of dawn waiting for Father Christmas or crack out the champagne on New Year - most of you aren't old enough! When the Christmas table is laid in Britain there is always a cracker at every place setting. The crackers are pulled with a loud CRACK!! and out pops a small toy or trinket, a paper hat in the shape of a crown and a slip of paper with joke, motto, riddle or trivial fact written on it. Crackers were invented by Tom Smith a London confectioner who was looking for a new way to promote his boiled sweets. Little did he realise his invention would become a tradition! Do you like cracking jokes? Here are some I got in crackers last year - will they have you cracking up? Q: What do elves learn at school? Q: What do you call a snowman in summer? Q: Who is a snowman's favourite relative? Q: What sits under your Christmas tree and sings all day? Q: Who brings presents to animals at Christmas? I was never known for my great singing voice (this is still true!). Cracking under the pressure our music teacher warned us to sing up or else... so I put all my heart into it, his comment was "Nice to hear the boys at last!" On the merit of my weird deep voice, I got into the school choir and one of the things I remember most vividly was the Christmas Carol Concert in the local church. Huddled in our uniforms under between the sparkling tree and the altar, the dare was who would sing the wrong words to the carols. Here are some of my favourites and some I found on the Web. to hear slave elves in the snow. Why don't you have a crack at writing your own? Phrasal verbs and idioms with crack. Enjoy the holiday! Stay safe and see you in the New Year! Happy 2014!